Bennetta Betbadal (center) was born in Iran in 1969. She fled to America at the age of 18 to escape Islamic extremism and the persecution of Christians that followed the Iranian Revolution. Bennetta initially settled in New York City, eventually moving to California and marrying her husband, Arlen Verdehyou, a police officer. They moved to Rialto, California and had three children, now ages 10, 12, and 15. Bennetta graduated from Cal Poly, Pomona with a degree in Chemestry. She accepted a position as an inspector for the San Bernardino County Health Department where she has served for many years. Bennetta was proud to work for the people of San Bernardino County. She loved her job, her community, and her country. Her greatest love, however, was for her husband, her children, and her large extended family. Bennetta left the house Wednesday morning, excited about a presentation she was scheduled to give to her supervisors and coworkers at their annual meeting. It is the ultimate irony that her life would be stolen from her that day by what appears to be the same type of extremism that she fled so many years ago. 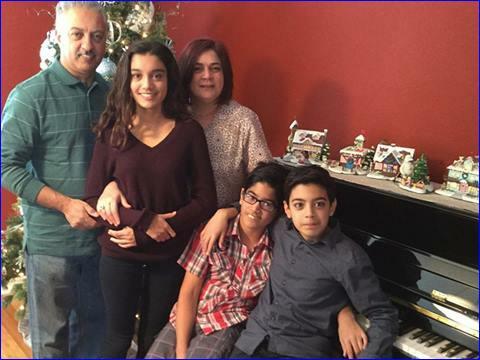 Bennetta Betbadal, born in Iran in 1969, fled to America when she was 18 to “escape Islamic extremism and the persecution of Christians that followed the Iranian Revolution,” her family said in a statement.On Wednesday, she was among the 14 victims shot to death at the Inland Regional Center in San Bernardino by a husband and wife under investigation for possible Islamic extremism. The family statement said Betbadal settled in New York City after she came to America and eventually moved to California, where she married her husband, a police officer at Riverside Community College, in 1997. They moved to Rialto and had three children, two boys and a girl now ages 10, 12, and 15. After graduating from Cal Poly Pomona with a degree in chemistry, Betbadal took a job as an inspector with the San Bernardino County Health Department in 2006. Verdehyou said he and his wife exchanged texts at 8 a.m. Wednesday. He told her he had withdrawn money from the bank and would do some Christmas shopping. He told her to have a great day. Betbadal left the house excited about a presentation she was scheduled to give to her supervisors and co-workers at their annual meeting at the IRC. “She decorated a beautiful Christmas tree,” her husband said. The couple, religious Roman Catholics, were married in March 1997. According to her LinkedIn account, Betbadal also had a bachelor of science degree in biotechnology. She spoke Farsi and Assyrian and listed her skills as government, policy, research, training, analysis, community development, policy analysis and program development. On Thursday, Verdehyou was with his two sons and daughter at their Rialto home as they awaited word of Betbadal’s fate. Although he had not heard from her since their Wednesday morning text exchange, he was holding out hope. The news finally arrived when coroner’s officials came to the door. Family members said Betbadal’s greatest love was for her husband, her children and her extended family. A gofundme account was established to assist them.